This month's meetup theme, (following our Meeting Schedule for 2016, that we outlined in Dec 2015) will be on our Alternate Energy Venture Development Cluster. During this month's meetup we will be introducing to the Southern Colorado market, the opportunity for companies to apply to the Rocky Mountain Clean Tech Open Accelerator, (see below). After participating last year as a mentor for a Boulder based company, SIVA (http://www.sivaisenergy.com) through the Clean Tech open last year, (2015) we were asked to provide some company recruiting help by the Clean Tech Open Rocky Mountain chapter to see if we can solicit new Clean Tech oriented companies from Southern Colorado for participation in the 2016 Program. The Cleantech Open is a not-for-profit organization that runs the world's largest accelerator for cleantech startups. Our mission is to find, fund and foster entrepreneurs with big ideas that address today's most urgent energy, environmental and economic challenges. A network of more than 2,000 volunteers powers this process: remarkable professionals who lend their time and expertise to entrepreneurs, facilitating the growth of the cleantech industry and the positive impact that will come from such technologies. Come to this month's meetup for a complete overview of the Clean Tech Open Accelerator opportunity and how your company can participate. Overview of the status of the AE/VDC and a summary of our progress on the Power Paradigm Fund to support it. We are now considering a Colorado State-based Crowdfunding Campaign for the fund and want to present the opportunity to the CSE Group for consideration and early participation in development and execution. Come to this month's meetup to get in on the inside discussions of what this process looks like. PPVDC Fund I is a new Alternative Energy venture investment partnership and fund being developed by Ensemble Ventures, LLC that is one of the targeted “Micro-Funds” in our “3Ci” (Collaborative Corporate Capital Investing) Seed Stage Fund Management Program. Ensemble is a Colorado Springs, Colorado-based “Venture Ventilator” providing business development, technology adaptation and integration support, and go-to-market strategies and tactical support services for young technology-oriented and software and business service firms. We are seeking strategic investment and tactical participation partners for our new seed-stage venture fund to help develop innovations in the Alternate Energy marketplace. If you have some successes you want to report on, some challenges you are facing, or want to find out more about some of the other Entrepreneurs and Companies in the CSE Group, now is your chance. Talks can span from a minute to 5 minutes to 10 minutes, (as long as you are engaging and interesting you can command the floor) ! 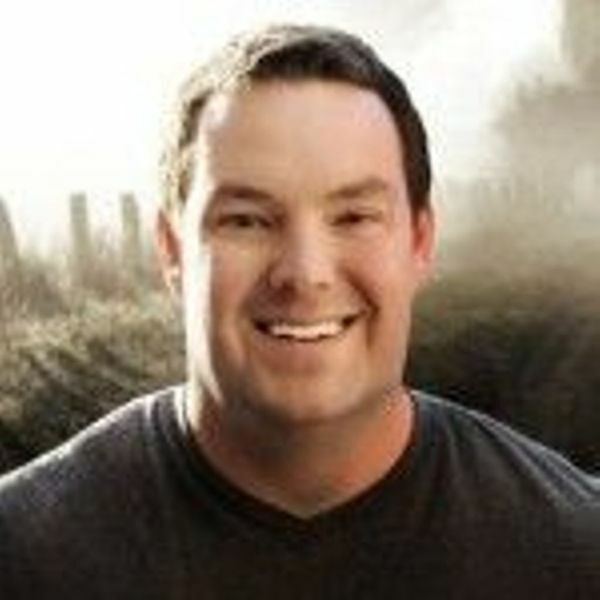 But we have a special guest speak this month for our HOMELAND Community Responders Themed Meetup... And that will be Mr. Cody Cornell, Cofounder and CEO of Swimlane.com, a new Boulder based company that originated in Arizona, but has now relocated to Colorado. They are offering a state of the art security operations management platform. I was introduced to Cody at the recently held RVC HyperAcclerator program last month in Denver where I participated as a Mentor for some of their candidate companies in the start-up business development, and pitch program. I invited Cody to come down to Colorado Springs and pitch our group on his unique Security Solutions, and to introduce him to the Colorado Springs Cyber Security Community. For more on Cody and his background see below. our scheduled agenda for the first six months of the year, and to open-up the floor to feedback and suggestions from the group to help tune and calibrate our Meetup Format, aspirations for our Venture Development Clusters, (including our SaaS/Cloud/Internet VDC, and emerging HOMELAND Community Responders VDC), and how we as a group can support and collaborate with other organizations and groups locally to help build-up and support our Entrepreneurial and Innovation communities. We are looking for member inputs and suggestions here, so come prepared to contribute and support the process. Cody is responsible for the strategic direction of Swimlane and the development of its security operations management platform. His passion for open exchange of security information and deep vendor integration drives him to pursue opportunities to maximize the value his customers receive from their investments in security operations. Collaborating with industry leading technology vendors, Cody works to identify opportunities to streamline and automate security activities that speed cyber response and enable security orchestration. 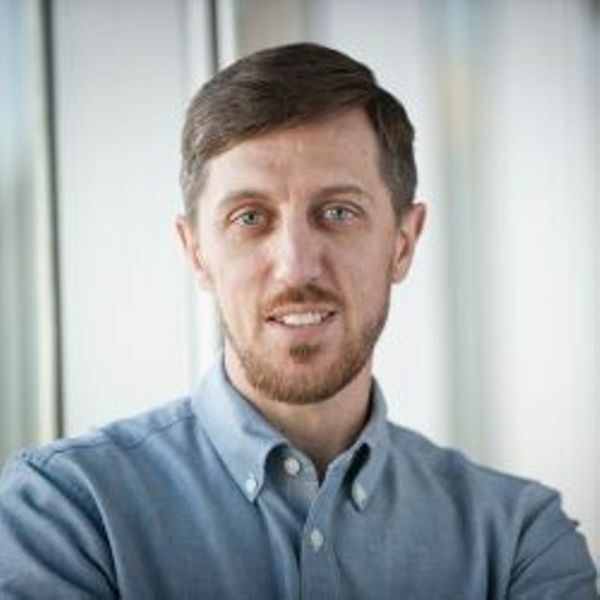 In 2011, Cody cofounded Phoenix Data Security Inc., a focused cyber security professional services organization known for their ability to blend strategy and engineering with an organization’s business requirements. After beginning his career in the U.S. Coast Guard, Cody spent 15 years in IT and security, including roles with the U.S. Defense Information Systems Agency (DISA), the Department of Homeland Security (DHS), American Express and IBM Global Business Services. Come to the CSE Group Meetup this month and let's give Cody a warm and enthusiastic Colorado Springs Business Community Welcome ! Hope to meet some of our new members as well ! Well, as we enter the start of a new year, (and our 9th Anniversary in July), it's time to take an introspective look at the CSE Group and our goals and objectives for the new year. Would like to create a "Round Table" format this month as we open-up 2016 to discuss the new year's goals and objectives, review our scheduled agenda for the first six months of the year, and to open-up the floor to feedback and suggestions from the group to help tune and calibrate our Meetup Format, aspirations for our Venture Development Clusters, (including our SaaS/Cloud/Internet VDC, and emerging HOMELAND Community Responders VDC, and how we as a group can support and collaborate with other organizations and groups locally to help build-up and support our Entrepreneurial and Innovation communities. Below is a first "six-month" look-ahead schedule for 2016 to give you an idea of what we will be focusing on in terms of the development and growth of our Venture Development Clusters (in 4 key vertical market areas out of our master list of 6), as well as some of the new initiatives and activities we will be pursuing during the year. February 2016 – HOMELAND Community Responder Venture Cluster Meeting and Update on 3Ci Fund. - First HCR/VDC Cluster Mini-Meeting. April 2016 – Healthcare Venture Development Cluster Meeting. - Third HCR/VDC Cluster Mini-Meeting. May 2016 – Launch of Expanded Coffee Crew Program with Subject Matter Experts and Forums. - Fourth HCR/VDC Cluster Mini-Meeting. June 2016 – Six Month Review and Progress Meetup on all VDC initiatives. Hopefully will have HCR/VDC $1M Challenge Fund in place to support HCR 5x4 Challenges. If you would like to present and participate as a Business Speaker, for an in-depth 30 minute presentation or pitch as an Entrepreneurial Speaker for our unique "10-Minute Pitching" format, (that gives you time to pitch and present your visionary product or service for the first 10 minutes) for any future meetup... let us know. At the CSE Group, we provide you with ample time afterwards to have our members help critique and provide you with valuable feedback on your existing or planned venture concept or startup idea... So contact us and we can get you scheduled to present or pitch at one of our upcoming monthly meetups. 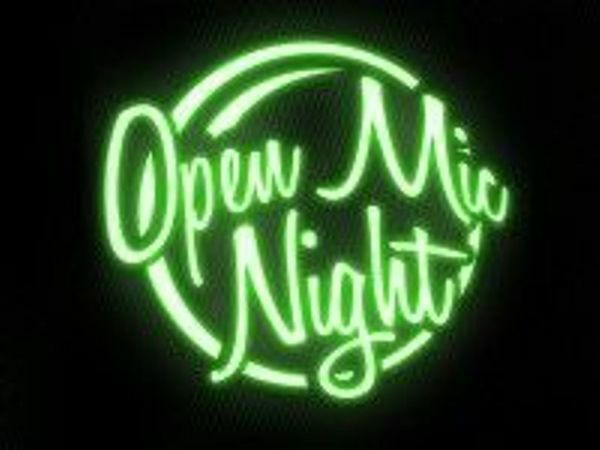 And again tonight we will have our popular "Open Mic Night" where you get to "Take the Mic from Mike"... ! Looking forward to seeing some of our new members and kicking off 2016 with a responsive and member-centric focus ! 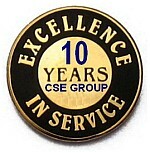 Ok, another year has passed and its time to meet and celebrate the holiday season for the CSE Group and its Members ! In December we obviously meet a week earlier due to the holiday break next week so we are meeting tomorrow night, (Thursday Dec 17th) at our Home Base at the East Library. 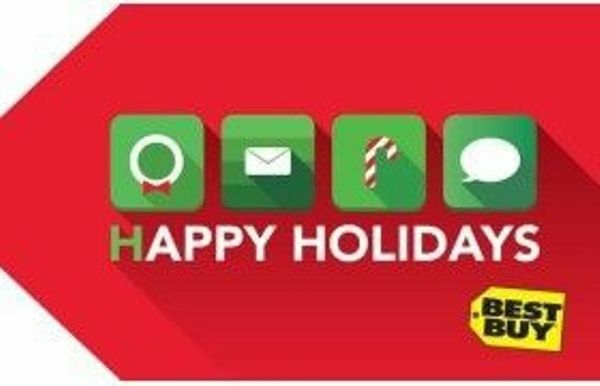 Holiday Food and Fun and Drawing for a $50 Best Buy Gift Card ! So come and hang out with us for our Holiday Celebration where we will reflect on the past year's accomplishments, discuss some of our new plans and initiatives for 2016, and will even have a drawing for a $50 Best Buy Gift Card for a lucky CSE Group member who will do some extra "Personal Electronics Shopping" this year !! 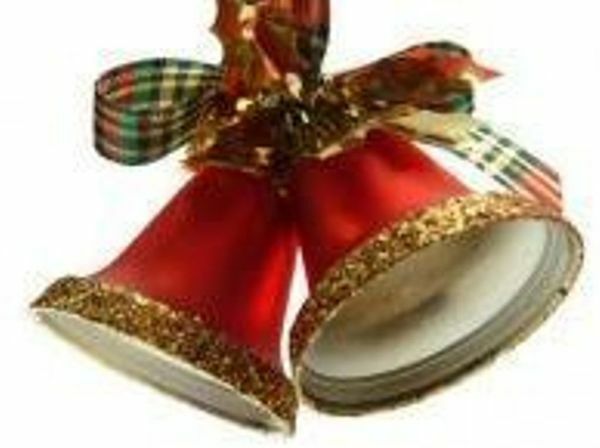 Will put on some Cool Christmas Music, and set-up for a Party... no scheduled speakers, or venture pitches this month. Time to get know some other CSE Group members and chill. Looking forward to a fun relaxing evening ! September 29, 2015 — Mike Schmidt, the Founder/CEO of Colorado Springs, CO based Ensemble Ventures, LLC and Brian Siravo, Founder/CEO of Accinctus, LLC today jointly announced that Ensemble and Accinctus have become Champions of National Cyber Security Awareness Month (NCSAM) 2015. Both Ensemble and Accinctus will be joining a growing global effort among colleges and universities, businesses, government agencies, associations, nonprofit organizations and individuals to promote online safety awareness. 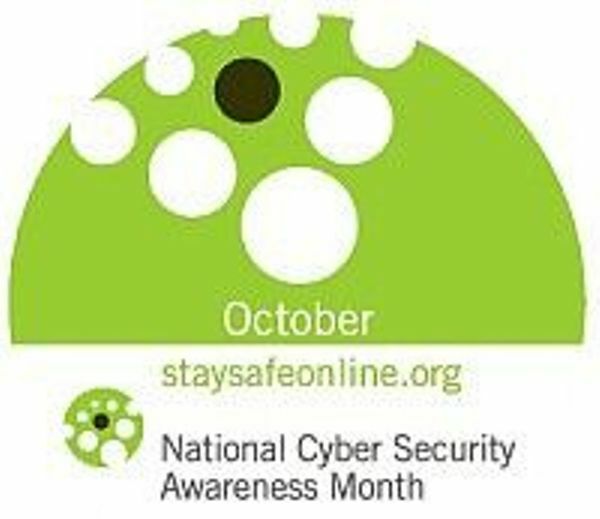 Celebrated every October, National Cyber Security Awareness Month was created as a collaborative effort between government and industry to ensure everyone has the resources needed to stay safer and more secure online. As official NCSAM Champions, Ensemble and Accinctus recognize and take responsibility for its commitment to cyber security and online safety. In addition, Ensemble and Accinctus announced they will be working with other Colorado-based small business, aerospace, government and technology organizations, as well as the Colorado Springs Entrepreneurs Group (http://www.colospgsbiz.org) to expand the educational activities and awareness about Cyber Security and Homeland Defense and Community Preparedness through the formation of a new HOMELAND Community Responder Venture Development Cluster (HRC/VDC) in Colorado Springs that is designed to create a Grass Roots interconnected collaboration network of participating companies addressing innovative solutions to Cyber Security, Homeland Defense, and Community Preparedness challenges. "The Champion Program is a vital part of making National Cyber Security Awareness Month a success each year,” said Michael Kaiser, executive director of the National Cyber Security Alliance. “We are thankful to our 2015 Champion organizations for their support and commitment to our shared responsibility of promoting cyber security and online safety awareness." HCRVennDiagramSMThe HCR/VDC creates a collaborative community-focused environment to address challenges and find solutions within the cyber security, homeland defense, business continuity, and community preparedness areas. These disciplines share many common interests in the goal of protecting our local community, while working with both state, and national agencies, who utilize similar processes, tools, and strategies while addressing very different needs to prepare for, respond to, and recover from natural and man-made disasters of any size. The National Cyber Security Alliance (NCSA) is the nation's leading nonprofit, public-private partnership promoting digital privacy and the safe and secure use of the Internet. Working with the Department of Homeland Security (DHS), private sector sponsors and nonprofit collaborators to promote cybersecurity awareness, NCSA board members include representatives from ADP, AT&T, Bank of America, BlackBerry, Comcast Corporation, EMC Corporation, ESET, Facebook, Google, Intel, Logical Operations, Microsoft, PayPal, PKWARE, Raytheon, Symantec, Verizon and Visa. Through collaboration with the government, corporate, nonprofit and academic sectors, NCSA’s mission is to educate and empower a digital citizenry to use the Internet securely and safely, protect themselves and the technology they use, and protect the digital assets we all share. NCSA leads initiatives for STOP.THINK.CONNECT.TM, a global cybersecurity awareness campaign to help all digital citizens stay safer and more secure online; Data Privacy Day, celebrated annually on January 28 and National Cyber Security Awareness Month, launched every October. For more information on NCSA, please visithttp://www.staysafeonline.org/about-us/overview/. We are going to be introducing a new local Venture Development Cluster in the Cyber Security, Homeland Defense and Community Preparedness area, that we believe can help to play a local role in organizing a developing a significant economic development program for Colorado Springs. (See the detailed overview below). Also, we will be hearing a business pitch from a team from Wolff Corporation who will be making a presentation on their new initiatives in illuminated design and manufacturing using electroluminescent panels, electroluminescent wires, and LumiLor, the electrified painting process, that can light up almost anything ! (See the detailed overview below). This new Venture Development Cluster or "VDC" is being developed by Ensemble Ventures, LLC and Accinctus, LLC to create an economic development and community innovation initiative for Colorado Springs in the area of Cyber Security, Homeland Defense and Community Preparedness. We are holding this first public meeting to solicit input and feedback from interested community members, city organizations, corporate participants, etc. * Note: this is our Draft Logo and Branding concept. We are open to input and suggestions on its look and feel and messaging. Will discuss at the meetup. At this point we are attempting to create both a mission brand as well as one that can be cross-purposed and utilized in other cities and communities. We will be distributing a "Green Paper" at the Meetup, (which is a draft report and consultation document of policy proposals for debate and public discussion) as the first step in our process to help introduce our concept to the community, which will be updated with a more formal white paper to help drive the implementation and execution of the HCR/VDC initiative. To bring together interested parties in a collaborative environment to identify challenges and develop solutions within the focus areas of: Cyber Security & IT Resiliency, Homeland Defense, Business Continuity, and Community Preparedness. Through the HCR/VDC our mission is to create a vibrant local economic development program that helps to create real world solutions for educating the public about the real threats of cyber security, and creating tools and methods for prevention of and combating against cyber terrorists. 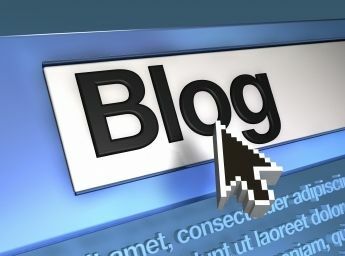 We also seek to create a forum for public and private awareness about homeland security and developing appropriate responses and community preparedness solutions, and educating businesses of all sizes about the need for business continuity and supporting ongoing community preparedness initiatives that are already underway and established and or need further development and refinement. The HOMELAND Community Responders Venture Development Cluster (HCR/VDC) is based on the Venture Development Clustering (VDC) and 3Ci Micro-Funding model developed by Ensemble Ventures, LLC. and implemented and tested with the Colorado Springs Entrepreneurs Group (CSEG). Other VDC clusters are already up and operating in Colorado Springs, so this is our third initiative that needs your support. 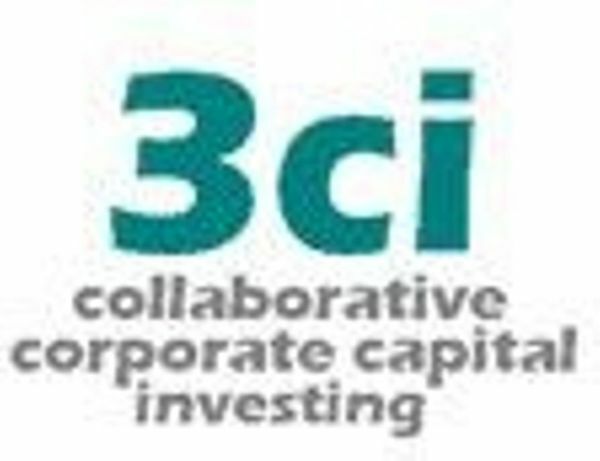 In addition to the creation of the grass-roots Venture Development Cluster Concept we will be developing and raising a $25 Million dollar 3Ci (Collaborative Community Capital Investment) "Micro-Fund" that will help us to identify, coordinate, engage, and underwrite as many of the key interested stake-holder businesses, organizations, and people who want to make an impact in protecting their local Homeland Community, and creating new innovative products and services to help develop a set of resilient hardware, software, services, methods, approaches, and best practice responses and solutions to Homeland Security and Community Preparedness that can be used locally or exported to other communities. (1) We will provide a collaborative environment for customers, partners, and service providers to explore solutions to increase resiliency in their business, non-profit, faith-based, government, or other organizations. If anything the HCR/VDC will be come a living, breathing networking resource for the local community to interconnect and collaborate together that goes beyond simple industry directories or occasional networking events. This is a proactive and engaging process that rewards participation. (2) We are developing and plan to maintain investment resources with a formal process to support local new and small businesses working in the areas of cyber security, homeland defense, business continuity, or community preparedness. 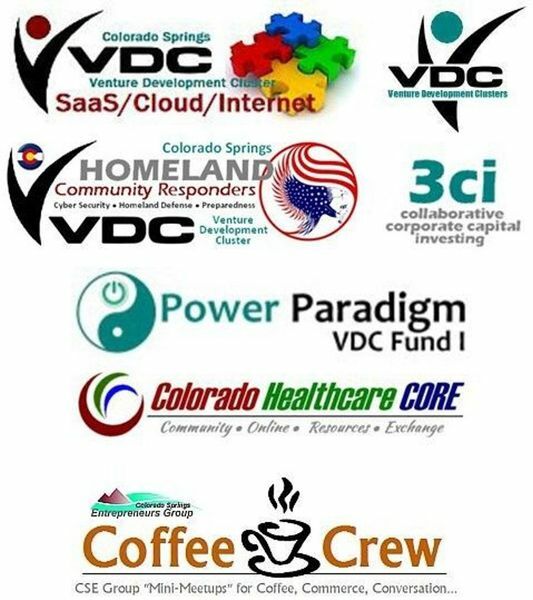 As such, we will be creating and raising an initial $25M "3Ci" Collaborative Community Capital Investment" Micro-Fund that will be used to support local entrepreneurs, companies and projects in Colorado who will be participating in the HCR/VDC program, and will provide the resources necessary to support the Collaborative Community Challenges. 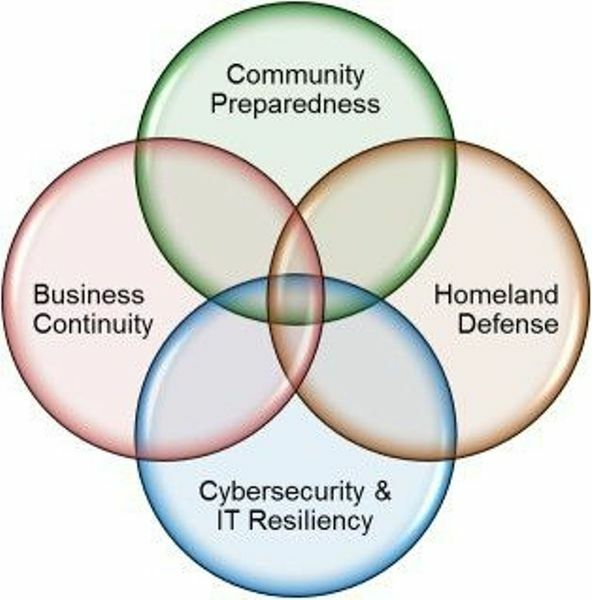 (3) We will be developing and deploying 4 separate "Collaborative Community Challenges" that will identify the top 5 challenges facing each of the 4 major areas of need: (1) Cyber Security & IT Resiliency (2) Homeland Defense (3) Community Preparedness, and (4) Business Continuity. (4) In each of these areas the participating members of the VDC will be "self-deterministic" in identifying and peer-reviewing the responses by people, companies, and collaborating organizations to the 5 Major challenges in each of four major areas of need. From here we will reward capital prizes ranging from $25,000 to $100,000 for Challenge winners in addition to assisting and marshaling support from collaborating and participating companies in the cluster who have a stake in the successful outcome of the various challenges. Each HCR/VDC focus area will bring professionals and participants across multiple disciplines, professions, and organizations together that will be able to break down their respective areas of needs into more detail to identify the interests of the providers and customers in each area. (1) The business continuity and cyber security participants would work together to address the risks of a long-term power failure on a business that relies on their network and data to function (such as a bank), as well as how to train and educate consumers and businesses to cyber attacks on their local IT Infrastructures, networks, and communications and computing devices. (2) The cyber security and homeland defense participants would collaborate if addressing how to protect the community from a cyber-attack on our electrical grid from a foreign entity, or how to better identify potential "human threats" locally to create a responsive crime tipping, alerting and notification solution that straddles local law enforcement, state and federal agencies that is community driven. (3) The community preparedness, homeland defense, and business continuity participants would work together when preparing how to respond and recovery from a major disaster such as a wildfire or earthquake, and how to better integrate and work with the various aid and support agencies that operate at the city, county and state levels. (4) All participants would collaborate when dealing with the threat of a violent terrorist attack (such as a bombing) of a major event or critical infrastructure within the community. Interested participants in the VDC may include private companies, non-profit and faith-based organizations, government agencies, community service groups, investors, and individuals with interest in the 4 focus areas of the VDC. We encourage you to come to this months meetup and learn more about our HCR/VDC vision, and we encourage you to bring a friend or business acquaintance as we embark on this local economic development initiative. It's a work in process, so this is your chance to jump-in and participate in a meaningful way. The Wolff Corporation is the world’s most innovative company in illuminated design and manufacturing. Combining multiple illuminated technologies including electroluminescent panels, electroluminescent wires, and LumiLor, we are able to light up almost anything. The Wolff Corporation has two brands – Wolff Snowboards and ElectroPaint Lighting. 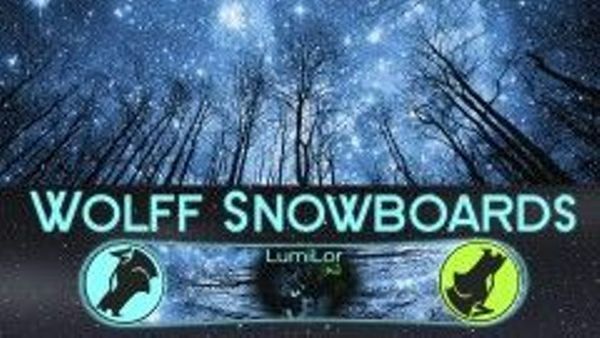 In just a few days, Wolff Snowboards will be launching the world’s first electroluminescent snowboard on Kickstarter. Our other brand, ElectroPaint Lighting, will be the only LumiLor Lab in the state of Colorado, and only the 5th LumiLor Lab in the country. LumiLor is a paint that lights up when electricity is run through it. This means that anything that can be painted, can be lit up – including bicycles, motorcycles, cars, airplanes, buildings, and more. We are taking LumiLor orders now, and will start completing LumiLor projects once the rest of our equipment arrives at the end of October or beginning of November. Our lighted snowboards, lighted longboards, and lighted hoodies can be purchased on Kickstarter at special pre-launch prices. Production on those items will start at the end of October, and everything purchased on KickStarter will be shipped by December 15th. 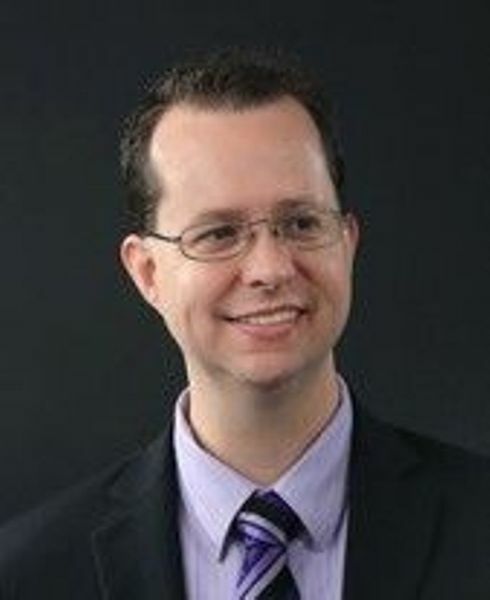 Scott Curry, Chief Strategy Officer – Scott is a business consultant with over 15 years of experience. He has run a number of companies, and now helps inventors and entrepreneurs start their own businesses. Using a combination of innovative and traditional strategies, Scott gets new startups to a point where they are profitable, with systems and procedures in place to continue being profitable for years to come. Scott helps companies get capital, find manufacturers, hire the right team, and build processes and procedures that will lead to their success. Scott joined The Wolff Corporation in May and assists the CEO in the development and implementation of The Wolff Corporation’s strategic vision. John Trujillo, Chief Operations Officer – John joined The Wolff Corporation earlier this month. John previously worked as the operations manager for a large technology company here in Colorado Springs. He has been busy helping The Wolff Corporation source vendors, purchase equipment, and locate a manufacturing facility. Soon John will be hiring a team of skilled employees to manufacture our snowboards, longboards, and hoodies. John will continue to be an integral part of the team as The Wolff Corporation starts manufacturing next month. So come and support your local CSE Group, and participate in helping to create and shape the new Homeland Community Responders Venture Development Cluster we are creating. This month's Meeting Theme: "Alternative and Advanced Energy"
As you know, I did a "Sneak Preview" at last month's meetup on a new company we are working with and mentoring in conjunction with the Colorado Clean Tech Open named Siva Cycle (http://www.sivacycle.com) that is now based in Boulder after recently moving to Colorado from Boston in June. They also have operations in Emeryville, CA as well. Well, next week at our August 24th Meetup... We will have the REAL DEAL ! So, as promised, I have asked the Co-Founder and CEO, David Delcourt to come to the Springs this month and do a full presentation and demonstration of their exciting technology developments that will be "extending" their core Atom Generator technology into new Kinetic Energy power creation markets both domestically and internationally. They are in a growth mode, looking for strategic partners and additional capital so let's see if Colorado Springs can put a full court press together to help ! Siva is a 2+ year old company that has developed an innovative USB-based charging solution for bicycles called "Atom". The Siva Atom is a lightweight USB generator to charge any of your personal electronics as you cycle. Easy and intuitive to install, you can charge while riding or once you arrive, thanks to the 1650mAh removable battery pack. After an already successful Kickstarter campaign back in 2013, (where they raised $126,000) they already have a full year of sales under their belts with REI and a number of cycling distributors in the US and worldwide. Currently David is the CEO and Co-founder at Siva Cycle. Siva designs and produces portable power solutions for cyclists, people on the go, and the 1.3 billion with no access to electricity. Design forward and cost conscious, Siva Cycle is re-defining the idea of a personal power ecosystem, delivering clean, kinetic energy at a fraction of the cost of existing solutions. David has a long history specialized in energy, sustainability and renewable's across a variety or sectors, and concentrate on high impacts. 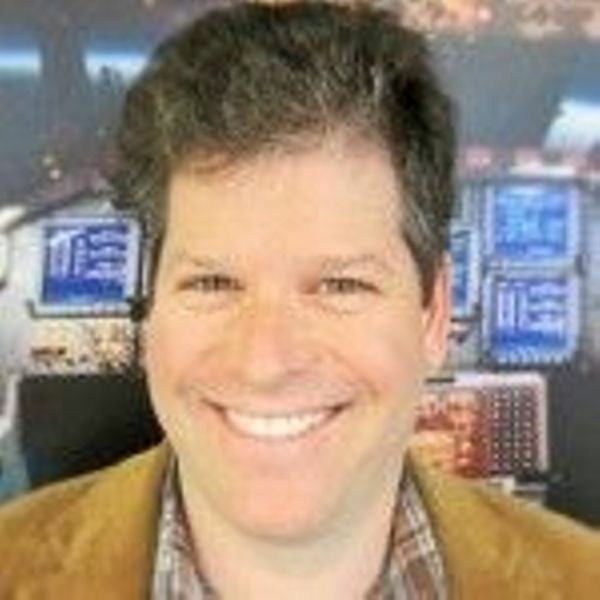 He enjoys building small teams to tackle big problems, identifying strategic partners, niche markets, and alternative channels to distribute unique solutions.His expertise includes business development, key account management, product development, product positioning, and strategic marketing. Previously he was Director of Business Development for Noveda Technologies after Noveda acquired the company he co-founded - MakeMeSustainable - in July 2011. He has held and operated in roles including founder, COO, sales manager, business development manager, product development specialist, and energy consultant in a variety of positions. He was an Analyst of econometric models, evaluating financial damages litigation and rate cases, and drafted World Bank telecom report with a team at Nera (Now Mercer Consulting). He speaks French and Spanish and is interested in expanding opportunities internationally for Siva. 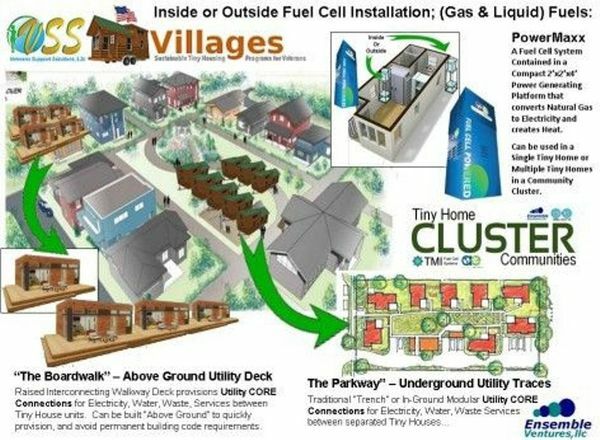 During the Tiny House Jamboree recently held in Colorado Springs over the weekend of August 7-9th, Ensemble showcased an early concept overview of the Tiny Home CLUSTER Communities concept that is being developed by Ensemble Ventures and its Fuel Cell Technology Partner, Technology Management, Inc. to support the VSS/Villages initiative that Veterans Support Solutions is creating to enable various third party Veteran Village organizations that are being developed locally in Colorado and nationwide by a variety of Veteran Support Groups. We will review our presentation for those who were not able to attend, and outline our strategies for helping to develop these low-cost, but high quality solutions for Homeless Veterans, as well as the Civilian Population at large. Also I have asked Tami Donaldson of Veteran Support Solutions, L3c to stop by this month to provide her perspective and impressions about our joint presentation at the Tiny House Jamboree, and to offer some insights and her vision about the future for VSS and our initiatives to help fight Veteran Homelessness through new housing capacity management programs and our Tiny Home CLUSTER Communities concepts that can support third party Veteran Village Initiatives here in Colorado and across the US that are under development by a number of third party organizations. Veterans Support Solutions is committed to assisting the local Veteran community by providing resources awareness forums to ease the transition and to achieve sustainable growth through building credibility, loyalty and trust from our client base while providing deliverables to our shareholders. Launched and led HR organization to support 567 personnel in mobilization exercise and provide updated data with zero errors for financial and personnel record changes including life insurance beneficiary modifications, security clearance processing/status, promotions, physicals, and medical updates. 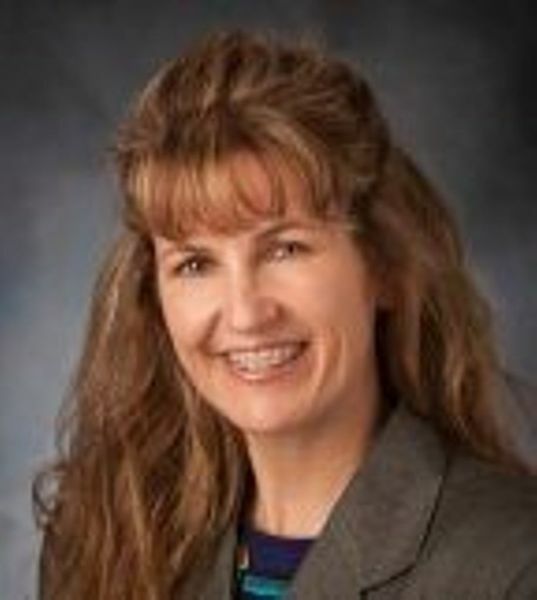 Commanded $10M+ transportation department budget, managing logistics and orchestrating end-to-end tracking process that delivered 10-fold improvement in vehicle scheduling and maintenance.Architect of electronic reference library, providing centralized platform of personnel policies and assignments for base of 1,000 personnel. And rounding out the evening, I will provide an overview of a new investment fund we are developing to support the growing Alternative and Advanced Energy markets. PPVDC Fund I is a new Alternative Energy venture investment partnership and fund being developed by Ensemble Ventures, LLC that is one of the targeted “Micro-Funds” in our “3Ci” (Collaborative Corporate Capital Investing) Seed Stage Fund Management Program. Ensemble is proposing the creation of this adaptive investment partnership or what it likes to call a "Collaborative Corporate & Capital Investing Fund (3Ci) to help support the portfolio companies in the Power Paradigm Venture Cluster and to help guide and mentor the business development, technology adaptation, and market potentials for advanced Fuel Cell Solutions, Electric Drives & Transmission, Battery Technology, and Distributed Energy Generation and online Demand Management Solutions. The Fund is being specifically formed to support the Venture Development Clustering of companies who are pursuing business opportunities in Alternative Energy solutions and markets. The Fund is seeking capital investment from strategic investment partners, seed angels, angel syndicates, private equity, and venture capital funds who seek to develop strategic relationships with technology development companies to help drive and develop advanced fuel cell technology solutions, electric drive train and transmission innovations, and distributed energy opportunities. Should be a fun night ! Bring a friend... As always the refreshments are free ! OK, we are all set for tomorrow night's meetup.. However, I wanted to update you on our agenda to let you know that in addition to the presentations being done by Chris Robbins and Brandon Brown from Open Book Ben... 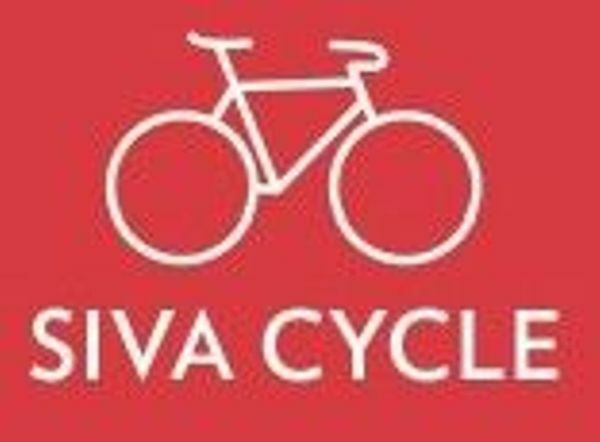 I will also be doing a "Sneak Preview" on a new company we are working with and mentoring in conjunction with the Colorado Clean Tech Open named Siva Cycle (http://www.sivacycle.com) that is now based in Boulder after recently moving to Colorado from Boston in June. They also have operations in Emeryville, CA as well. After an already successful Kickstarter campaign back in 2013, they already have a full year of sales under their belts with REI and a number of cycling distributors in the US and worldwide. The CEO, David Delcourt would have been here this month but he will be up in Denver tomorrow night at the Colorado Cleantech Industries Association participating in the “Pitch Practice with the Rocky Mountain Cleantech Open Semifinalists". However, David has agreed to come down NEXT Month in August and do a full presentation and demonstration of their exciting technology developments that will be "extending" their core Atom Generator technology into new Kinetic Energy power creation areas. So this is another reason why you are not going to want to miss this month's meetup ! So BRING A FRIEND and let's get a good turnout tomorrow night ! Open Book Ben Goes Commercial Aug 1st ! 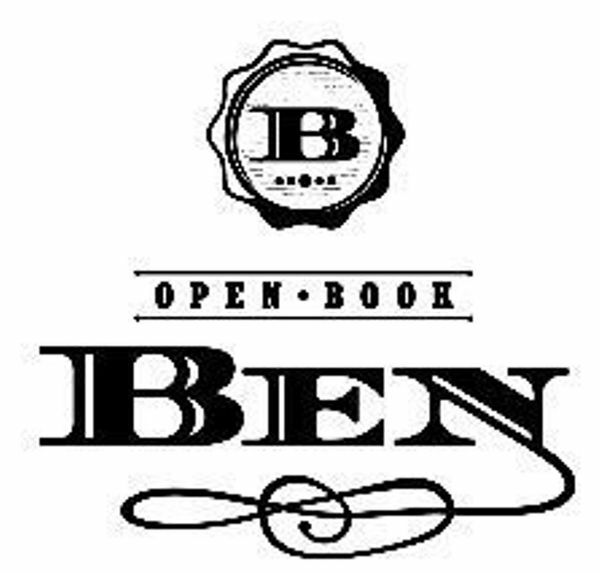 We are going to be celebrating the upcoming commercial launch of Denver-based "Open Book Ben" in a "Pre Launch Presentation and Celebration" at our meetup this Thursday night. "Put your business reputation back where it belongs - in your hands! In development for two years now, Open Book Ben is scheduled to go "commercial" on August 1st, (after an extended Beta Testing period with independent business, and a large number of banks and loan institutions who have been testing out the features of the new OBB solution). Note: Many of our CSE Group members have been beta testing the solution for the last month. If you are interested in participating in the Beta Test... Keep reading below. We will move through our standard Meet & Greet Session and Meetup Update agenda items for the first hour, and then will devote the next 2 hours exclusively for the Open Book Ben Team. Chris will start-off the evening with a business-oriented overview of his start-up journey to bring Open Book Ben to the market, describing his strategy, and tactics and covering the highs and lows of bringing a state of the art and "disruptive" SaaS solution to the marketplace. Then we will have Brandon present some of the technical details of spinning-up their unique online SaaS and Database management technology platform that currently has over 28 Million business records on file. As the lead designer and UI/UX expert, Brandon has had his "hand" in the development mix since day one, so will be sharing some of the technical highs and lows. Open Book Ben is a Denver-based software start-up developed by Chris Robbins and an amazing team of developers and a stellar board of directors that reads like a who's who in the credit reporting field. The company is focused on the development of a unique business intelligence and predictive analytics platform that will be available to businesses of all sizes. The company provides creditworthiness and Vendorworthiness (TM) data on nearly every business in the United States. Open Book Ben’s software platform, (currently in Beta), provides credit data and scoring on nearly every business in the United States. PLANT YOUR FLAG - Join the Open Book Ben community and make your claim in a revolutionary business exchange network, where you are in control of your company's reputation. TELL YOUR STORY - Let existing and potential customers and vendors know exactly who you are by actively participating in the management of your credit data and other critical business details. GROW YOUR NETWORK - Connect with an ever-expanding society of people you do business with, and together change the way small businesses get things done. Chris is an Entrepreneur and Legal Professional, with a JD from the University of Miami, and a B.A. in History from the University of Pennsylvania. Over the course of the last 20 years Chris has been engaged in a wide variety of corporate legal work, directing private equity investment, research and publishing, real estate development, and business incubation and venture capital investment. He was a Partner and Lynch and Robbins in Florida, a Managing Member of Cherry Creek East Investments in Denver, and the Executive Director of the Metro Denver Enterprise Center, (where I met him originally). His latest efforts have been focused on the development of Open Book Ben, his latest SaaS (Software as a Service) solution to disrupt the credit data and scoring market for business. Chris is an instrument-rated pilot, a rock climber and avid hiker, as well as a sailor who enjoys open ocean boating, (whenever he gets out of Colorado where there is real water) ! Brandon has over a decade of experience in visual design and UI/UX software envisioning, development, and deployment that includes projects with clients that range from designing-award-winning start-ups to established brands like the NFL. He is passionate about developing a harmonious balance between user experience and visual design in his digital platform experiences. At Open Book Ben, Brandon is responsible for overall brand development and direction as well as iterative product creative direction and specifications, requirements, and vision. Currently working on the Beta product with a heavy focus on upcoming visual UI/UX directions and product development that will transform how businesses interact with their credit profile data and reputation management utilities. Working on both web and mobile applications with a heavy focus on interaction and presentation. Previous to OBB he was the Co-Founder of The Sulky Brothers Manufactorium in Denver for 7 years, and the Creative Director for the Prestige Real Estate Group in Denver managing an in-house creative and marketing group that leveraged his Marketing and Communications education at Brigham Young University back in the late 1990s. If you decide you would like to participate in the current Beta Testing round, and actively test, evaluate, and provide feedback to the Open Book Ben development team, (though their online collaborative software support ticketing system) you will receive a free 1-year subscription to the Open Book Been Small Business Credit Monitoring and Rating service, (a $179.40 value) based on a $14.95 per month rate. After the first year of free service… you will be able to renew the OBB service on a paid basis for another 12 month period for a special 10-month rate, (or $149.50), where you will receive 2 months per year free for life. Standard annual pre-paid users receive 12 months of service with 1 month free annually if pre-paid, ($164.45). To lock in the initial FREE YEAR of service, as well as the discounted annual renewal rate afterwards, (12 months for the price of 10 months), all you need to do is create an Open Book Ben account at: http://www.openbookben.com­. After your account is created, simply submit an online feedback ticket with this “Invitation-Only” CSE Group Beta Testing code: "csebetaobb". Chris will “hook you up”, and you will be on your way. And be sure to let me know you signed up and are part of the beta testing team, (via an email or call). Chris has a "target" he wants to hit, and I'm interested in seeing if the CSE Group can rise to the challenge ! So, definitely mark your calendars for this Thursday at 6PM at the East Library as this is going to be a GREAT MEETUP ! Due to our short 2-hour format tonight, (due to meeting room scheduling conflicts at the Library with other non-profit groups) we will be meeting tonight STARTING AT 7PM. So if you come early you might end up spending time in the Library lobby... !! So we will have an extended "Meet and Greet" session at the beginning of our meetup to allow our members the chance to introduce themselves and their businesses, (existing and planned) while we have some initial refreshments. I have a number of proposed new events and initiatives planned for the second half of 2015 that I would like to present to the group for discussion and consideration. Will review and solicit feedback and suggestions. 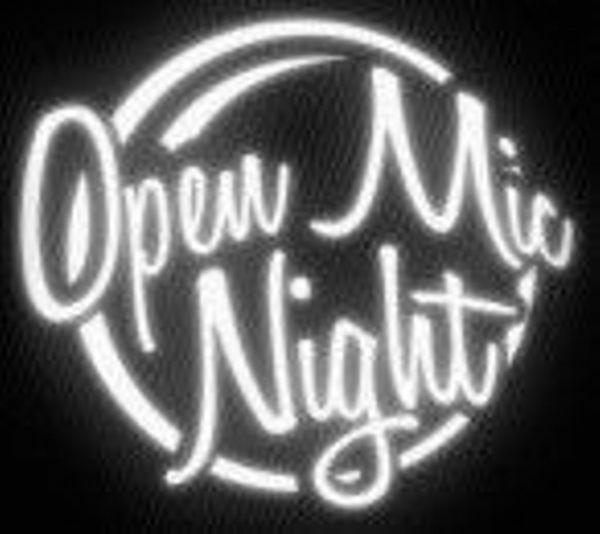 And again tonight we will have our popular "Open Mic Night" where you get to "Take the Mic from Mike". So see you tonight ! Come and join us for a fun evening of social networking and professional "pitching" as 7 Slovenian Companies and their staffs will be making "Professional Pitches" about their products and services to a local group of Entrepreneurs, Seed Angels, and small business professionals. 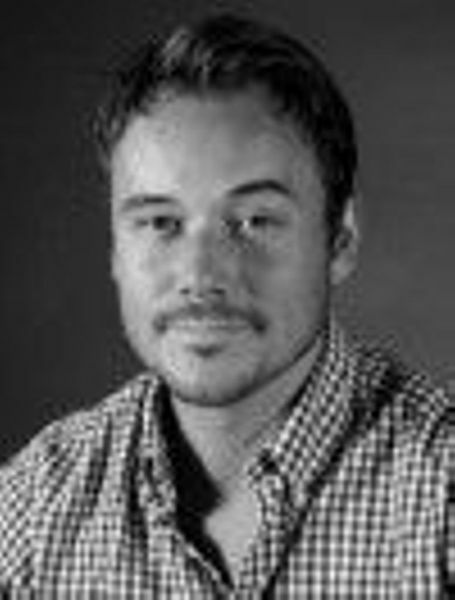 The Pitch Event segment will be Led by Mike Schmidt, the Chair of The Colorado Springs Entrepreneurs Group utilizing their successful Monthly Meetup-Group Format. "An Evening with a Business Delegation From Slovenia" or "Večer z gospodarsko delegacijo iz Slovenije" in support of AmCham Slovenia and its delagates to Colorado to provide some "up close and personal" social interaction with local entrepreneurs, small businesses, manufacturers, seed angel investors, and state and local economic development officials. AmCham Slovenia is one of the most active and influential international business communities in Slovenia, with more than 260 corporate members, it has assembled together some of the largest and most important companies in Slovenia. AmCham Slovenia has already been a member of the U.S. Chamber of Commerce in Washington, D.C., USA for 15 years. They work with many home and foreign businesses, as well as independent and government organizations in both the United States and beyond. 9:00PM - Conference Speaker Closes "Official Program"
Provides a wide range of consulting services for emerging and developing companies in Slovenia. Growing companies for specific situations need a consultant to the complex seniorsko marketing, managerial skills and also experience in the implementation of operational marketing content, realization of communication strategies. The companies business model and our professional skills to promote creativity in companies, on the basis of workshops with employees to help create a working atmosphere that motivates, promotes ideas and their promoters - internal entrepreneurs and encourage them to translating the ideas into real projects. Robotina Ltd. was established in 1990 and is a process control and automation systems developer and supplier. Robotina provides a wide variety of solutions for processes automation control and supervising systems in the food & beverage industry, for telemetry and control, and for energy management. The company also provides security systems and energy management solutions for the metal, stone and wood processing industries, as well as textile and transportation industries. Our company not only offers products but also services and complete solutions. Our services include research, development and production of custom-designed electronic components and today already widely known PLC controller CyBro. Robotina is one of the leading providers of renewable energy solutions in Slovenia. We have also developed a wide range of equipment and solutions including solar plant supervisory system, string monitors, control units and application software. Tajfun provides complete and integrated forestry machinery solutions, with efficient service and after sales support. Main products are firewood processors, logging winches, cranes and electronic digital calipers with its log scaling and timber cruising software to support fluid work in the field. Tajfun’s customers are distributors and dealers of our machines. We work through a large worldwide spread network of dealers and have subsidiaries located in the USA (Bellingham, WA), Russia (Moscow), Brazil (Curitiba) and Serbia. Final customers, the actual users of our products, vary from farmers, woodlot owners, big companies that manage forested areas, professional foresters and loggers, national institutions managing national or state forests and others. AZP is a full-service law firm in Ljubljana, Slovenia, providing a broad range of advisory services and legal representation to both national and international clients. The firm's main expertise is in the fields of Corporate and Commercial law, Competition Law, Public Procurement and Intellectual property law. The firm has offered complete legal support in numerous stock and asset deals, joint ventures, mergers and acquisitions. Our specializations extend into the fields of public–private partnerships, media law and telecommunications and advanced technologies. Today we are one of the largest law firms in Slovenia. Trimo has been developing original and complete solutions for building envelopes, steel constructions and modular space solutions for more than 50 years. Its engineering, production and sales teams provide high efficient, innovative and sustainable solutions to meet clients most varied needs. Trimo sells its products and services across more than 60 countries worldwide and has production facilities in Slovenia, Serbia, Russia and the United Arab Emirates. In its sector Trimo is regarded not only as a market leader, but also as a trend setter and a highly innovative company as proven by its receipt of numerous international awards for innovation and cooperation on projects which have received the most respected prestigious architectural awards. A Public Agency of the Republic of Slovenia for the Promotion of Entrepreneurship, Innovation, Development, Investment and Tourism. By connecting different stakeholders of the support environment and promoting the development of its services, we are creating an environment in which enterprising and innovative individuals bring their ideas to fruition, which leads to successful market realisation. Through implementation and development and the support of promotional activities and cooperation in designing various media contents, we raise the citizens’ awareness of the importance that entrepreneurship wields in the realisation of the citizens’ development potential, thus contributing, in the long-term, to the increase in new jobs and the growth and development of companies. For capacity planning and food and beverage logistics, please visit either the Colorado Springs Entrepreneurs Group or LnB Connectors Meetup Pages to officially register for the event. If you are already a meetup member you know the drill. 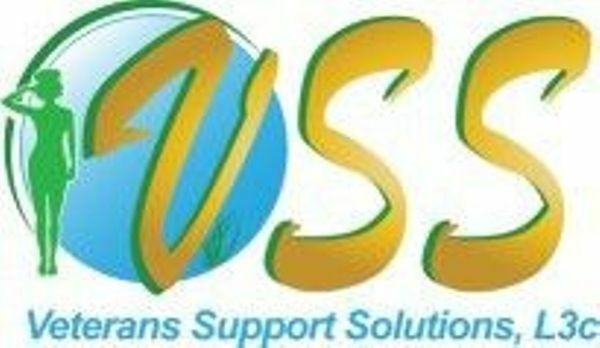 If you are not a member of either Meetup Group you can elect to join, (which will allow you to RSVP for the meetings), or if you like you can send an email inquiry using this contact form: http://www.colospgsbiz.org/contact-us and a CSE Rep will contact you. Looking forward to a fun and engaging evening !